This valuable work on the methodology of exegesis by Dr. Recep Dogan will serve as an important source of future works in the field. With his expertise in the history and exegesis of the Qur'an, as well as his familiarity and comprehensive understanding of Islamic disciplines, Dr. Dogan has managed to combine both classical and modern acquis. Presenting a variety of different approaches, Dr. Dogan also offers a broad range of Western approaches in reading the Qur'an. 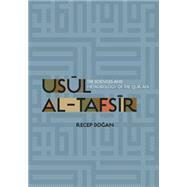 Recep Dogan, PhD, is a lecturer at Charles Stuart University, Islamic Studies, Australia. He completed his Bachelor of Divinity (Islamic Theology) at Ankara University, Turkey. He then continued on at Ankara University to complete his degree for Master of Islamic Studies and later a PhD in the Islamic Studies Department, Philosophy of Religion.